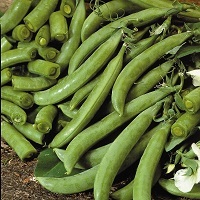 This improved varity produces a high yield of 8-9cm (3-4") pods with excellent flavour but all on a compact plant which grows to a height of 65cm (24") tall. Flat bottom drill 5cm (2") deep and 10cm (4") wide. Space the seeds 5cm (2") apart throughout the drill and allow 60cm (24") between drills, cover with soil.